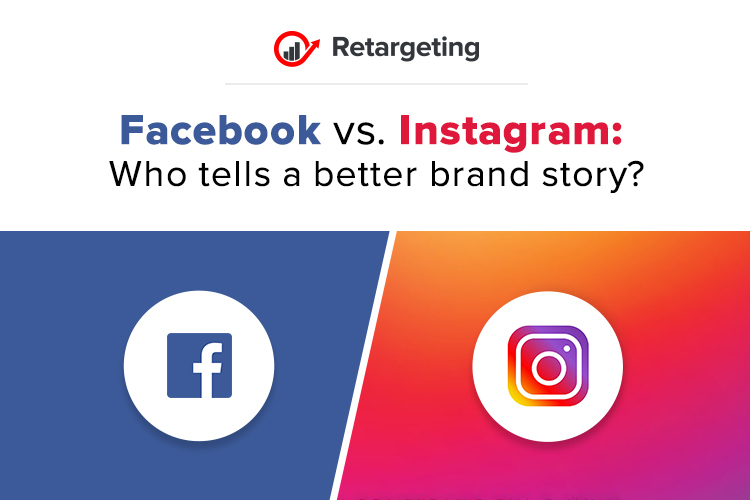 Facebook vs. Instagram: Which tells a better brand story? Gone are the days when a social advert was enough to get your online shop customers interest. In an online world of trending topics, ‘most talked about’ and continual sharing, businesses need to embrace storytelling to create conversations, appeal to their buyers and transform shares and likes into purchases. But which social media channels are the best way to engage your customers and how do you know which one is right for your business? From a classic novel to the next big action-adventure movie, people have always been drawn to a good story. Nowadays, this still remains true, and as we sign up for more and more social media experiences we love to hear more about and share them with our treasured online communities. In a world of fake news and terrible tragedies, online users look to social media to find stories to make their world a little bit brighter. And it’s no surprise that the most successful marketing strategies now also take advantage of social media storytelling to hook their customers and get their products shared and talked about too. But the questions remain! How do you get your business to become one of the most talked about things on social media, and which channel is best for you? – 62% of 65+-year-old use Facebook. In fact, about 79% of internet users log into Facebook worldwide, which means you can target a whole range of people all in one place. So, what are the best ways to advertise on Facebook? We live in an age of information overload. Audiences want to know where the products they buy come from, who makes them and the story behind the brand. Introduce your customers to the people behind your brand and create content that your target audience can’t help but like, share and comment on. Engage with their interests, respond to their comments and build your very own dynamic online community. Is enough to take a quick scroll through your own Facebook feed, one thing becomes obvious: video is a big deal. The most talked about and shared Facebook content is often video, with the average user reportedly spending just shy of two hours a day watching videos online. Don’t have the budget for video campaigns? Live video is another area that’s on the rise, with live videos receiving on average six times as many interactions as standard videos. Audiences value the honesty and authenticity of the broadcast and insight it provides. Don’t hesitate to use the power of live video and your customers will love a behind-the-scenes look at your business. – 8% of people 65+ use Instagram. Think about what makes your business unique, and create gorgeous images that match your brand ideals. As with Facebook, Instagram is focusing more and more on video, with short, snapshot videos becoming a useful way to share new information about your business. Whether you share photos, video or live video directly to your audience, keep in mind users expect this medium to be less polished, so experiment with behind-the-scenes video, live interviews and introduce your customers to the human part of your brand. Instagram is the perfect place to share examples of your products in-use and you can even get your audience to do some of the work for you. Also, you can create a user-focused hashtag and encourage customers to post their own images. That results in easy content that everyone will love! Both Facebook and Instagram have the own advantages and disadvantages when it comes to e-commerce, and which one you choose to prioritize depends largely on your brand. Audiences love stories that are creative, passionate and authentic and will only engage with content that they can’t help but share. Don’t put all your eggs in one metric!